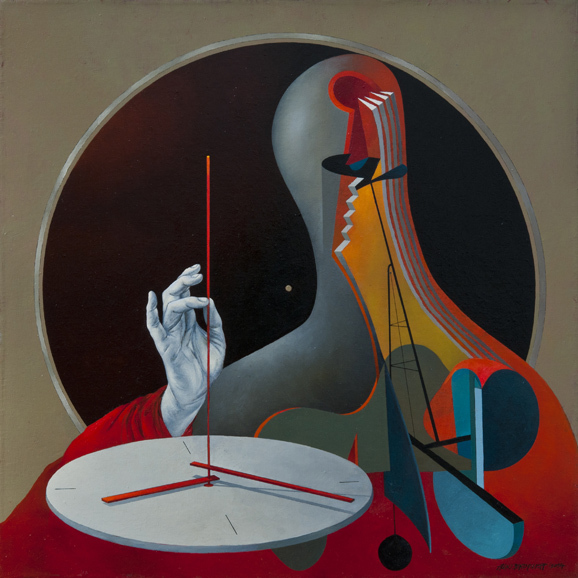 A cocktail of iconic styles, Alex Berdysheff’s work pushes the parameters of surrealism. 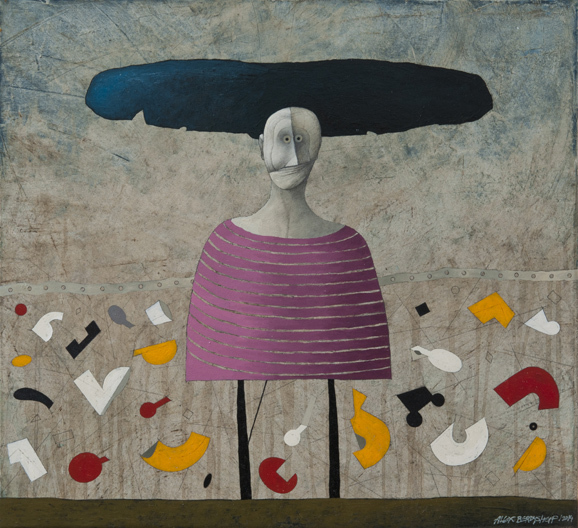 Drawing from past masters of the genre and overlaid with his own keenly felt impression of life, his paintings and mixed media compositions are vivid expressions of the human condition with all its travails. Alex Berdysheff was born in Tbilisi, the capital of Georgia, in 1964. In 1988 he graduated from the Tbilisi State Academy of Fine Arts with a diploma in Graphic Design, going on in 1990 to study at the Glasgow School of Art under a post-graduate exchange programme, where he held his first exhibition. His talent was recognised immediately by his professors and his surrealistic paintings were considered to show much future promise. Since these beginnings he has participated in solo and group exhibitions in England, Scotland, Spain, Russia, the Netherlands, Austria, Germany, Brazil, the USA, Canada, Kazakhstan and, of course, Georgia. 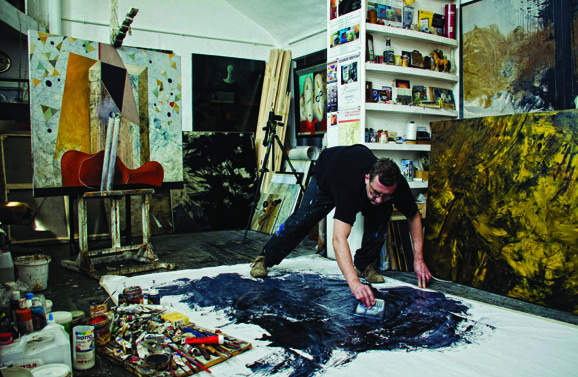 In 2000 he won the John Murray Thomson Award at the Royal Scottish Academy Annual Exhibition and in 2006 he won first prize at the Coca-Cola Tbilisi Jazz Festival Poster Contest. Berdysheff’s work is truly immersed in the surrealistic canon. Originally a philosophical, cultural and political phenomenon developed out of the Dada movement, it was expressed mainly through paintings and literature. From its epicentre in Paris, surrealism gradually expanded during the 1920s, gathering many artists, writers, musicians and filmmakers and became an international creative genre in itself. Many artists became involved in the movement, such as Dali, Ernst, Miró, de Chirico and Magritte. These and other artists’ work were at times outlandish, bizarre, eerie or downright weird, strange and fantastic. But so is the human psyche, and these artists were using painting techniques that allowed the unconscious, the id, the alter ego or the dreaming spirit to express themselves; the work was the conception of these dreamscapes. 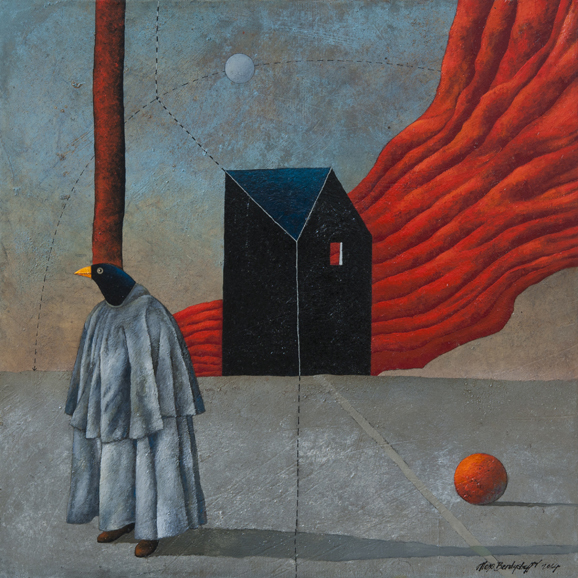 In viewing Berdysheff’s creations, one is immediately aware that he is a ‘traditional’ surrealist, if such a thing can exist. 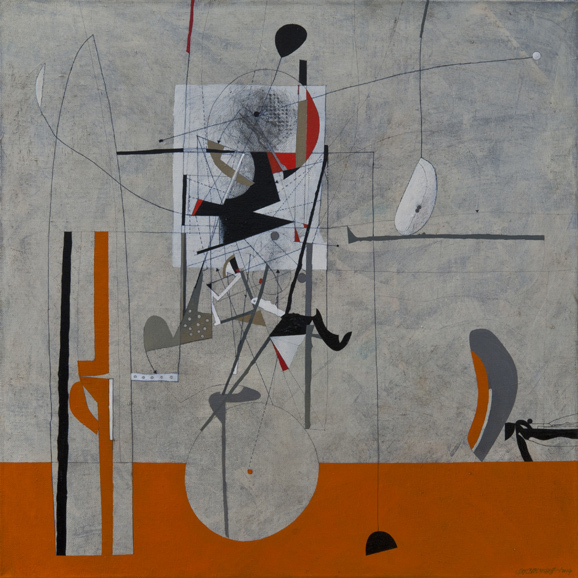 His work echoes that of Dali, Miró et al and, apart from the occasional reference to Picasso’s cubism, shows no compromise with other genres of art. Each image, be it a painting, a mixed media creation or a digital work, is unique unto itself and contains all the illogic, incongruity, abstraction and imagination one would expect in the field; and yet they are very aesthetic and they communicate. Profoundly emotive, the themes and tones of his work are as varied and diverse as the canvasses themselves, ranging from meta- physical paintings to social and human issues in which defiance or violent pathos coupled with deep scepticism stand in opposition to the peaceful. Some of his compositions are full of sentimentality, melancholy and sadness, some are laced with irony or humour, but he can also be whimsical. The artist’s digital works are composed of objects created by himself and photographed, which are then layered together and digitally composed into incredibly dramatic and startling images. Many (not all) are black and white with one dominant colour. In one or two pieces, the artist appears in the background. 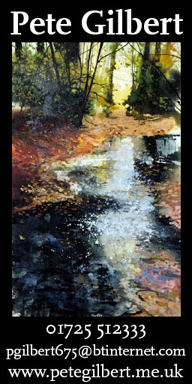 Alex Berdysheff’s paintings and mixed media works can be viewed at the Arundel Art Room and online at www.arundelartroom.com.